Santa Sabina, built in 1939 as a house of spiritual formation for the women preparing to join the community of the Dominican Sisters of San Rafael, served the Sisters' needs for training new members until 1970. Its Dominican design and Tudor-Gothic architecture were inspired by Mother Raymond O'Connor's visit to the Dominican Monastery at Stoke-on-Trent in England. 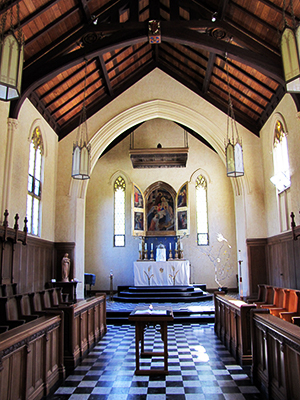 Upon her return to San Rafael, Mother Raymond entrusted to the renowned architect, Arthur Constable, the work of designing the novitiate building. It is named after Santa Sabina in Rome which is Center of the Dominican Order whose monastic house is joined to the ancient Church of Santa Sabina on the Aventine Hill. In the 1960s a wing was added to the building to provide additional bedroom space on the second floor and a large recreation/meeting area on the first floor. Since 1970, when the Center opened its doors to spiritual seekers of all traditions, Santa Sabina honors its history and heritage. Its contemplative roots permeate this sacred space and the present retreat and conference ministry herein. Staff continue to cultivate the Center as a place of study, prayer and community as they extend the ministry of the Dominican Sisters of San Rafael in support of contemplative spiritual exploration.